The bill has been retabled for the third time following another deadly year on Toronto roads, with more than 60 people killed. As a Toronto cyclist, Meredith Wilkinson always knew she could run into trouble on the city's roads. But the 40-year-old mother and transportation engineer never expected how life-changing that moment would be when it happened in September 2017. Cycling westbound in an east-end bike lane for her daily commute to work, Wilkinson was hit by a right-turning driver in a 25-tonne garbage truck. She was pulled by the front wheel, pinned underneath it, and dragged several metres — tearing off the tissue and muscle on her right leg. Somehow she stayed conscious despite the pain, her mind racing with thoughts about her seven-year-old son and her likelihood of surviving. Wilkinson wound up requiring extensive skin grafts and her leg was amputated above the knee. Even now, she's still recovering after spending five days in an intensive care unit, five weeks as a hospital patient, and six more weeks in rehab. 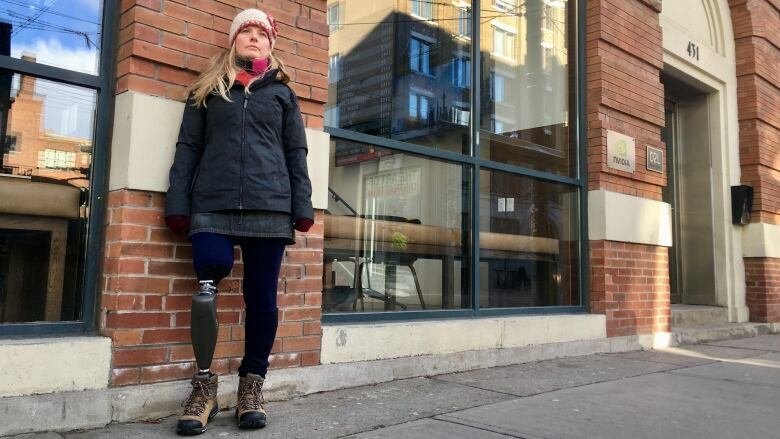 "Losing a leg is a lifetime sentence," she said in an interview with CBC Toronto. The driver who hit her was charged with careless driving, Wilkinson added, but could plead guilty to a lower charge and wind up facing only a fine. Wilkinson is among the victims and advocates hoping that changes with the third retabling of an NDP private member's bill to protect vulnerable road users — including cyclists and pedestrians — while beefing up consequences for law-breaking drivers whose actions lead to injury or death. "Tougher penalties on drivers will help keep all road users safe," said Jessica Bell, the NDP's transit critic, at a Wednesday news conference. Along with stiffer penalties, the bill would also allow a court to order a licence suspension, driver re-education, and community service related to road safety to drivers who injure or kill someone as a result of any driving offence under the province's Highway Traffic Act. With Toronto hitting more than 60 road deaths so far in 2018, with well over half of those being pedestrians, advocates say the time has come to make a change. To date, more than 15,000 people have signed an online petition supporting the bill, which has remained in limbo for roughly a year since it was first tabled by the NDP in December 2017. It later died on the order paper when the previous Liberal government prorogued the legislature in March. It was retabled in April, then the election brought in the new PC government. That lag has been frustrating for road safety advocate and lawyer Patrick Brown, who said the Coalition for Vulnerable Road User Laws​ has been calling for this kind of legislation for more than four years. The group is just one of 18 health, road safety and cycling advocacy organizations backing the bill. "It's no longer acceptable when someone breaks the law, seriously injures someone, kills them — whether they're walking or riding a bike — and they walk a way with a small fine," added Brown, a founding member of the coalition. In Toronto, city hall is spending roughly $100 million on a plan to reduce the number of road deaths to zero, including changing speed limits in various areas and investing in safety zones, photo radar, and intersection improvements. But the number of dead remains high, with more than 190 pedestrians killed by drivers, and hundreds more seriously injured, over the last five years — a situation CBC Toronto explored through the election season series Safer Streets. 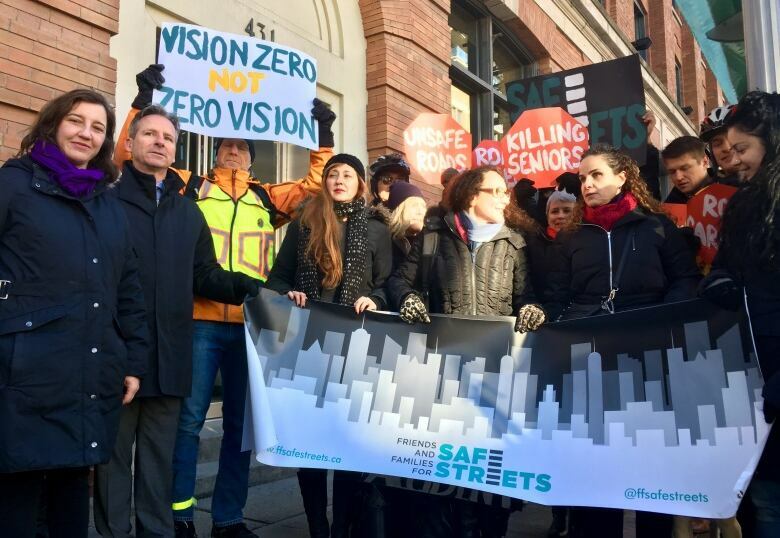 Coun Jaye Robinson, the outgoing chair of the city's public works and infrastructure committee who helped spearhead the city's much-criticized Vision Zero initiative, hopes the NDP's bill goes through and offers heightened consequences to deter dangerous drivers. "This would be a huge asset, another major tool in our toolbox," said Robinson, who was re-elected in October's municipal election. So will Premier Doug Ford's majority government back it? So far, the province isn't promising — or ruling out — its support. "This Bill was introduced this afternoon and we are still in the process of reviewing it," said Andrew Koolsbergen, a spokesperson for Minister of Transportation Jeff Yurek's office, in a statement. "Our government is for the people and we will make sure that any Bills we support are aligned with that principle."